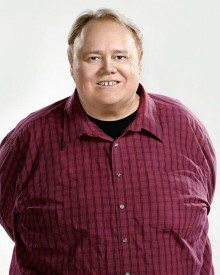 Louie Anderson is one of the most versatile and successful comedians working in Hollywood today, loved by the television audiences who never missed his nightly hit series “Family Feud” or his appearances on late night chat shows. He is adored by standing-room-only crowds in Las Vegas and respected by readers of his books. He is worshiped by the rising comics he mentors and encourages with his honesty and wisdom. Sharing the ups and downs of his childhood experiences as one of eleven children in Minnesota, Louie crafted comedy routines that rang true for his early club audiences while reducing them to helpless fits of laughter, routines that led him from his career as a counselor to troubled children to the first-place trophy at the 1981 Midwest Comedy Competition. Henny Youngman, who hosted the competition, recognized the diamond-in-the-rough genius of the young comic and hired him as a writer, providing invaluable experience that soon put Louie in his own spotlight on comedy stages all over the country. In 1995 Louie put his creative energies to work on the Saturday morning animated series “Life with Louie.” The long-running series based on Louie’s own childhood and his life with his father won three Humanitas Prizes for writing on a childrens’ animated series, making him the only three-time recipient of this award. It also earned a Genesis Award for its depiction of the proper treatment of animals and, most significantly, two Emmy Awards. His best selling books include “Dear Dad — Letters From An Adult Child,” a collection of alternately touching and outrageous letters from Louie to his late father, and “Good-bye Jumbo…Hello Cruel World,” self-help for those who struggle with self-esteem issues, as only an award-winning comedian could write it. Louie recently finished writing his newest installment on family,”The F Word, How to Survive Your Family.” He also signed on as a cast member on ABC’s reality diving show, “Splash.” Louie travels the States doing what Louie loves to do, Stand Up Comedy. Louie again delivers to his fans his inimitable brand of humor and warmth. Do you want to hire Louie Anderson? Directly request a quote. In 48 hours we can send you the availability of Louie Anderson If you would like to book Louie Anderson, Entertainment Booking Agency is the right place. We will offer you the best price and contact the management or we directly contact Louie Anderson. For corporate appearances or speaking engagements you can contact our agents and the will help you true the process. Tags: hire Louie Anderson, Louie Anderson booking, book Louie Anderson, Louie Anderson appearances, find more information on booking Louie Anderson for appearances, Louie Anderson speaking engagements, Louie Anderson endorsements/spokesperson, Louie Anderson appearance fees, Louie Anderson booking agency contact info, biography of Louie Anderson, Contact an artist booking talent agent find a speakers bureau that can book Louie Anderson, speaker booking agency for Louie Anderson, Louie Anderson booking agency, Louie Anderson booking for corporate event. EBA is one of the biggest entertainment booking agencies in the World. We book hundreds of celebrities, artist, athletes and speakers in a year. Important to know is that we are not claiming to be the management of Louie Anderson. We are not the official agent for Louie Anderson. Companies from around the globe book these artists and speakers true our company be course we have one of the biggest networks and we always have direct contact with the artist or the management. We help you to find the right celebrities for your corporate of private events. Please contact one of our agents to get free advice and we will help to get the world-famous artist on your party.